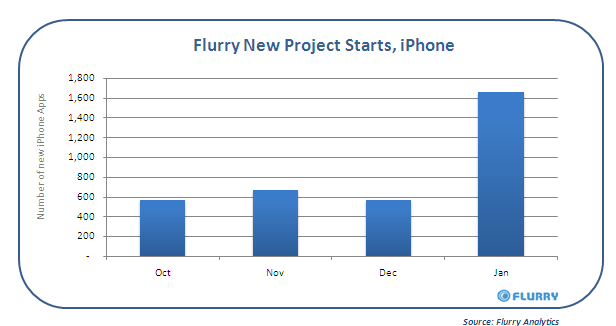 Mobile Analytics company, Flurry has released some interesting data points relating to the sudden spike in the number of iPhone developers adding their mobile tracking code to new projects. Flurry observed the sudden spike especially when the hype over the launch of the Apple iPad started to build up prior to the launch in February. The very controversial iPad if you still remember will be running on the same OS used by the iPhone. Flurry observed that the number of developers adding their analytics tracking code to new iPhone OS apps projects increased by three-fold in January as compared to what was supposed to be a waning interest as observed in the early part of December. During that time, developers seem to have been focusing more on the Android platform. So, are apps developers actually jumping onto the iPad bandwagon and preparing their applications in time for the release of the iPad? Well, Flurry’s data seem to show that this is happening. But, we have yet to see and March is just a couple of weeks away.